We are now over half way through 2018 and market uncertainty continues. Escalating trade tensions and political uncertainty are taking their toll on world financial markets. Are the USA and Europe allies or foes? How far will China’s tariff war go with the US? Where to next for interest rates globally and how quickly? The most recent figures from APRA show that household deposits (cash and term deposits) in Australia have hit an all time high of $895bn. To put this into perspective, in June 2007 before the GFC, household savings were only $260bn. Currently in SMSFs alone we have around $170bn of deposits. The increase in total household deposits since 2007 has been close to 250%. It shows that we are still living in an investment environment where certainty of returns and outcome is most important to the end investor. In August 2016, the RBA reduced the official cash rate from 1.75% to 1.50%. This was the lowest official cash rate in the history of Australia. We are now over half way through 2018 and still no sight of a rate rise – 2 years later. So when will we have a rate rise? Will the next movement be up or down? 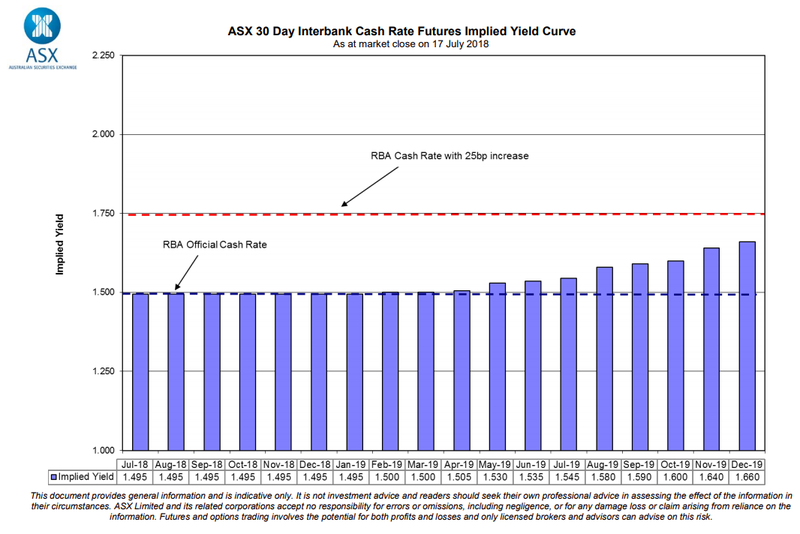 In my March quarterly update, I included a chart like the one below on the futures market’s view of the possible movement of the RBA cash rate. Back then, on 30 April, the market had priced in a rate rise by August 2019. The chart below illustrates that the market is only pricing in a 64% chance of a rate rise by December 2019. The RBA Board Meeting July minutes reintroduced a comment indicating the next movement in the cash rate was expected to be up. At the same time, other comments indicated ‘no rush’ – so it seems that the lower for longer mentality continues. How have XTBs and our suite of portfolios compared to our fixed income industry counterparts? There are some fundamental differences between an XTB and an ETF or a managed fund. XTBs provide exposure to a single bond that has a defined coupon amount, coupon payment date and maturity date. In contrast, managed funds generally consist of up to 450 bonds, have no defined income amount and run for perpetuity. There have been innovations in the fixed income world in recent years, including ETFs that offer floating rate and fixed rate exposures. Recently a new ETF which is purely a long duration index exposure of 5.5 years to 10 years maturity has been offered. If you think that interest rates will rise however, this may not be the best solution for your client’s portfolio. We designed our XTB recommended portfolios and SMAs to make investing easier for you and your clients. Furthermore, our model portfolios and SMAs continue to outperform other fixed income listed (and unlisted) investments. Therefore, I have included a link below to a report that covers the performance of our recommended portfolios and SMA after fees. Concentrated High Yield –4.39% p.a. High Yield – 4.34% p.a. Maturity Ladder (Series 2) – 3.86% p.a. XTB SMA – 3.74% p.a. Maturity Ladder (Series 1) – 3.64% p.a. Cash Plus (Floating-Rate Notes) – 2.61% p.a. ACBC Fixed Income No. 1 SMA or the ESG Fixed Income SMA. This quarter, I have featured an analysis of one of our most popular portfolios, the Concentrated High Yield portfolio vs a range of popular managed funds and ETFs. This portfolio was created on 30 Aug 2016 with the aim of helping advisers create portfolios to meet different client needs. Chart 2 and Table 1 show the XTB Concentrated High Yield portfolio has outperformed all other funds, from 31 Aug 2016 till 30 Jun 2018. FUND RETURNS P.A. VOLATILITY P.A. Returns and volatility are annualised. Reminder: When selecting XTBs or a bond fund / ETF, the key benchmark to look at is the expected yield to maturity after fees. Because yield to maturity is a forward-looking number, it gives you what you are expected to earn if you hold to maturity. As a result, you never know accurately what the yield to maturity is in a fund, as funds don’t mature – they are perpetual. It is important to remember that the yield to maturity of a fund or ETF is quoted before fees. Therefore, to get the real yield to maturity you must deduct the fees being charged. Most noteworthy, XTB fees are already incorporated within the price of the XTB on ASX. So there are no further reductions to account for. The chart above is for illustrative purposes only; it does not constitute investment advice and is based on data from sources believed to be reliable. This chart is only made available to professional investors within the meaning of section 9 of the Corporations Act, it should not be provided to any person who is considered a retail investor within the meaning of section 761G of the Corporations Act. This chart is based on certain assumptions, as set out below. It has been assumed that all distributions are reinvested on the relevant ex-dividend date for the purposes of this chart. Where a distribution is listed as omitted this is treated as a null distribution. All data uses the Last Price, as determined by the data source, as such it may not represent transactions that are capable of execution at any particular point in time. The theoretical XTB Concentrated High Yield portfolio uses the original constituents from the portfolio start date on 30 August 2016, all data, including for the period prior to the XTB Concentrated High Yield portfolio start date, is sourced from Bloomberg using the Underlying Bond prices, plus the securities manager’s margin (fees). As such, it may not represent transactions that are capable of execution at any particular point in time. All other data is sourced from Bloomberg, using the published unit price (after fees).